Hot news just in from the Monaco office of Yachtzoo of a $4 million-plus price drop on Feadship’s 46.33m motor yacht Jana. Built by the De Vries yard in 1986 and last refitted in 2009, this superyacht has been Lloyds classed since new and, MCA compliant, has an excellent charter record. Her Pierre Tanter interior sleeps up to 12 guests in a master, VIP, two double and two twin cabins plus two Pullman berths. 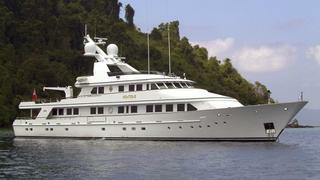 With a range of 2,500 nautical miles at 12 knots, Jana is now down from $13.995 million to $9.95 million.